He suggested a restaurant, I located a coffee shop, we could save money by making our own food, then 4 of 10 family members cancelled, so a local brunch place it would be for our family Christmas gathering! I intended to meet up with them that Sunday the 23rd but the old beast I battle interfered then lo within hours they were in the driveway and headed to the backyard just moments after I’d made it out of bed! Thank the Lord I’d showered before my recovery nap; the gals had dressed in warmer garments so their greetings on the Wintry patio meant I could see my beloved’s wonderful adult children after all. The gifting seemed awkward but we were generous all around anyways then whammo it hit and seizing returned body-wide in full view, right there in the open air: my winter coat and silent eyes all around me. Some had not witnessed this hell before . . . what the hell? I prayed as my body shook violently and slumped down into the lawn chair, with me still wondering why I have to be awake to try to figure out what I am supposed to do during these nightmares when I can do nothing at all? A plan came to mind and when my body writhing stopped, I dangerously dashed for the sliding glass door whilst screeching from my loins how horrible this is, my deepest sorrow, and my love for them all. I still dunno if anyone heard my guttural tears that began as I closed the door and lasted for the next hour with episodes that returned as I dragged my body back to the bedroom to crash. Again. Then I wondered, where was Steve? Sounds in the background told the story that they had all left, including my beloved, with them . . . No one had brought me any food (I guess I was sleeping earlier when they were eating lunch with the live Christmas band delighting their visit), said good-bye, or showed any concern for my welfare . . . until 2 of them texted me messages of concern hours later. Ah, the days of living by the (inadequate) communication of our smart phones! It was all I had so it was something I guess. Steve returned a couple of hours later to tell me they had gone on with their plans of go-kart racing. The pictures on Facebook told the story of the great time they had. Do I want to see them? Say what? This type of unexplained episodes continued, preventing worship at a Christmas eve service the next night so I braced myself to spend it all alone. How could I possibly hold my husband hostage at home with me when a couple of his adult children remained in town? Extreme chemical sensitivity was about to take him down as well when he got to the church and it reeked of burning frankincense so badly he could not stay inside the building. So we watched the services together online at home . . . Silent night, holy night. Christmas required extra rest before a simple celebration with my beloved: no decorations or fancy foods just some gifts and an appreciation of the meaning of this day that was more apparent for me this year than decades ago. Simplicity does that. Christmas is measured in moments, however small, when you focus on the love that comes from our Savior, Jesus Christ. The traditions are lovely when you have them too. I tried to be positive and loving to my amazing man who has been faithful through so much heartache and sickness from me. How can I possibly sweat any small stuff when he always gets the big stuff right? Little did we know that we would both become very sick with the flu within 3 more days. We had an errand to run together, at the end of which my beloved was already fading with illness. I joined him within a day and gratefully after some cleaning and making a pot of soup for us both. We still had not gone grocery shopping which didn’t matter since neither of us could eat hardly anything. That didn’t change much as the worst of this flu lasted FOUR DAYS! By the grace of God we survived our Christmas holiday. My beloved spent half of his vacation time from work battling the flu and barely seeing his adult children visiting from out of state; I never really recovered from this whack-a-this-or-that. This Winter illness is going to take me a few more days from which to stabilize . . . but interestingly the seizure attack episodes that flared at the beginning of our holiday week are down again. Yes, they are down! I have just found a way to take some nutrients that have been critically and chronically low and which are likely a major contributing factor to the convulsive episodes. To become seizure-free would be my desired earthly gift this new year. Thank the Lord we made it to 2019!!!!!!!! As you may have read in the About Julie page of this blogsite, I treated for Chronic Lyme Disease early in the four years that I have been battling serious illness. I had not recovered my health four months after a bout with viral hepatitis and our Family Practice Physician convinced me and Steve that latent Lyme disease was keeping me sick. Then the story changed a few times . . . So in other words, my life is kinda hellish a lot of the time! Today was no exception. Then right in the middle of the trauma there were tender encounters with the sweetest man on the face of the earth: my Stevers. We talked in between seizure attack episodes, he provided care when I could not move, and we made the most of a low-key day. It was the “same story, different day” around here. And something else happened too: I may have discovered another piece of this wretched illness mystery: Latent Lyme Disease can affect the gut which in turn can contribute to neurological complications much like the ones that have eluded all of our attempts at recovery. No, it’s not systemic Candida as I suspected when I wrote my last Treatment Update. It’s called “Bell’s Palsy of the Gut,” a term coined by Lyme Literate Medical Doctor (LLMD) Virginia T. Sherr. “Gastrointestinal Lyme disease may cause gut paralysis and a wide range of diverse GI symptoms with the underlying etiology likewise missed by physicians,” states Dr. Sherr in the April 2006 issue of Practical Gastroenterology (p. 74). There are tests that can be performed to determine the presence of Borrelia burgdorferi along with other microbial pathogens transferred in tick saliva after a bite. In two weeks I will have a diagnostic procedure in which these tests could also be performed. Whoa Lord. Is that why I felt led to add an anti-microbial to my anemic treatment plan? God is good. All the time. God is good. Today I felt led to add back a probiotic that I actually was able to tolerate this time. The new information about Lyme disease may explain the increasing gut inflammation this past year and my supremely negative response to a trial of a far-infrared light treatment to my abdomen. Or to any abdominal exam. Or to physical therapy to the hip flexors in the lower part of the abdominal wall. Or to certain foods. At any rate, a new door has opened and there are new possibilities for getting well. Perhaps it is time to re-visit the diagnosis of Lyme disease. Mrs. Sommers uses her interviewing style to cover topics that are usually more difficult to understand when it comes to the complexities of serious illness. She includes a broad range of diseases, treatments, and types of practitioners, only occasionally mentioning her other best-selling books! I especially appreciate the index for locating topics of interest. This book might have shortened my learning curve if it had been available 3 years ago. May it shorten yours! Who knew that finely crushed, Unsalted Kettle Potato Chips would be like a salve to my wounded frame today? In the spirit of my previous foodie post, I must say that finely crushed chips make my creamy beef stew-ish soup puree quite special. Since there are potato chips in my belly, life will go on after all! Dental galvanism from dissimilar metals in the crowns of the root-canaled teeth. Now we recognize that while we certainly won’t know the exact cause until the teeth are extracted and I have treated the infection, if needed. I am on a waiting list for a local surgeon after a trip to see a qualified biologic dentist out-of-state resulted in being passed on to someone else equally far from home. My husband has led us to the decision to find someone else locally; I am on a waiting list to have my appointment moved up from April 2nd with the best local oral surgeon. Those Gentle Readers who have followed me for awhile know that I have thought before that we found the “root cause” of everything. The “it” still could be complicated by underlying Lyme disease, mold neurotoxins and the definite mercury toxicity fueling it all. Yet one thing is now clear: these teeth still have to come out! 1. When a person has a root canal procedure, a dead tooth is left behind. The primary root canals consisting of nerve tissue and blood are scraped out and a rubber-like substance called gutta percha is stuffed into the remaining cavity. While the opening is treated with an antiseptic, no one can ever know for sure if any secondary root canals were left un-cleaned and untreated. Any remaining nerve and blood tissues dies and can provide food for aerobic and anaerobic bacteria. Between the root canal channel and the outer enamel of the tooth is the dentin, consisting of 3 miles of dentil tubules. These are too numerous to be completely sterilized before placement of the gutta percha. Thus there is a possibility of infection seeping into the dentil tubules. When a tooth is healthy, all of the dental tissues are washed with blood but this is no longer possible with the severing of the blood vessels during the root canal procedure. However, if the infection grows, the bacteria can eventually seep from it’s hidden little factory in the tubules into the jaw bone and surrounding blood supply thus potentially affecting the mouth and rest of the body. It is well-recognized that these bacteria can be exceedingly dangerous. Lastly, during a root canal procedure the periodontal ligament is often left in place around the dead tooth, adding further risk for infection and necrosis from this dead tissue lying next to the gums or jaw bone. Only in the dental industry is a once-living, now-dead tissue and a dead structure (the tooth) allowed to stay in the body; otherwise this tissue would be surgically removed as in the examples of damaged frostbitten fingers, gangrenous toes, severely burned skin, etc! 2. As spoken by the nurse in my doctor’s office this past week, reddened tissue means inflammation and often indicates the presence of infection. Pain in the upper left portion of my jaw has lasted over 13 years, increasing lately to the point of requiring periodic Ibuprofen and topical treatments such as (diluted) clove oil. I now chew food only on the right side of my mouth, avoid hot and cold temperatures, and consume soft/pureed foods so as to minimize the chewing and pressure on my teeth that trigger convulsive episodes. Geez! 3. Though considered controversial by traditional dentists, it is easy to find hundreds of mainstream and holistic dentistry sites that have described the dental galvanism (aka “battery effect”) that can occur from the use of dissimilar metals in amalgam fillings, crowns, and dental appliances. I had my amalgam fillings (generally consisting 50% of mercury) removed many years ago yet there remains a question if there is any remaining underneath one of my crowns. The bigger issue is that three of the four crowns in my mouth consist of a combination of metals. To establish if the presence of metals (in the presence of saliva) creates any currents between my teeth, yesterday my husband and I touched the probes of a voltmeter to the surface of the two teeth in question. The voltage was TWICE that of my skin on my arm! Steve questioned if this small amount of voltage would be of any clinical significance? Note that microcurrent (significantly less than the voltage we measured on my teeth) is used in rehabilitation for the treatment of pain. This means that the body must be affected by tiny currents. Too bad the current in my teeth is not mitigating pain! Conversely, I wonder if this battery-effect is over stimulating a part of my brain, triggering the convulsions instead? Now to flesh out number 3 a little more, I refreshed myself on a little neuroanatomy. The upper branch of the trigeminal nerve innervates the upper and lower jaw of the mouth. 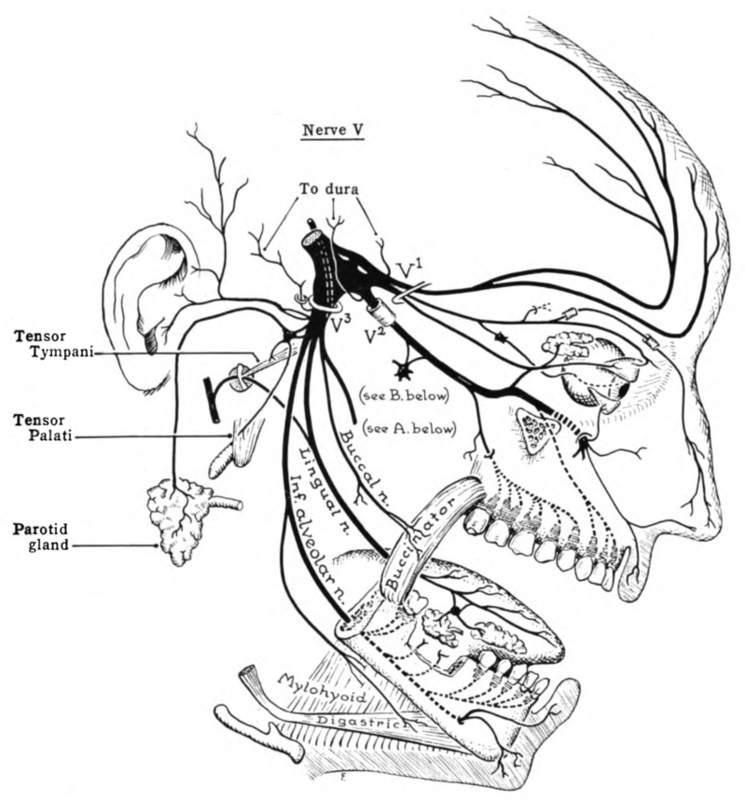 The trigeminal nerve originates from a part of the brainstem called the “Pons” which sits on top of the spinal cord inside the back of the skull; three branches extend on each side of your head and across the face with the mandibular branch dividing over the top and bottom of the jaw. During dental procedures, this is the nerve into which a dentist injects a numbing agent such as Novocain. The motor division of the entire trigeminal nerve derives from the basal plate of the embryonic pons, and the sensory division originates in the cranial neural crest. To hypothesize what electrical stimulation from 1) this battery-effect flowing 2) BACK TO the brain in the first two of these three areas could mean for a person, I took some liberties and looked up the symptoms of the person who has a stroke affecting these three areas. (The cranial neural crest has more significance in embryonic development and stem cell research than the discussion here so I left it out.) My findings are fascinating. Please note that the exact symptoms will depend on which biological “electrical circuits” and junctions are affected since the structures are so small and interrelated; we cannot know for certain which structures will be affected. Regardless, I have listed a few symptoms that I do experience from each of these respective areas during my own seizure attack or convulsive episodes. Damage to Basal Plate Symptoms: Loss of movement, such as stiff, rigid or weak muscles; tremors or body shakes; aphasia (difficulty speaking); changes in eye movements; or changes in motivation or personality. Damage to Embryonic Pons Symptoms: Weakness of upper and lower extremity (arm and leg on same side as damage); dysregulation from inhalation to exhalation (difficulty breathing); sleep paralysis (inability to move when falling asleep or after waking up and altered dreams); difficulties with balance (ataxia); dizziness due to vertigo; or clumsiness of a hand or arm. A person with a severe stroke may need help with self-care or feeding as a result. Wow. These all have happened in some combination with each “tazoring” as I call it. Thankfully there are higher parts of my brain in the cerebral cortex that appear unaffected and thankfully the symptoms are not permanent so far! I would not be able to write this blog if the damage was permanent. But I know I cannot overthink all of this. After the onset of acute upper back pain two days ago, I feared what the range of random electrical charges on my weakened frame could do to my heart. Or was it a heart attack? Well, no. I had gone too far. Pain comes from thrashing around and will be dealt with when I return to physical therapy and chiropractic care sometime after dental surgery. Wasn’t this interesting? There is much hope in putting all of this together. Please join me in praying for the Lord’s will in all of this. And if it is the Lord’s will, I would love to have these two crazy teeth outta here ASAP! Time for these little ones to go! I prefer to be toothless in Indiana with crushed potato chips on my soup of the day instead of this saga continuing. Even if my hypothesis was wrong, I am grateful for the mental stimulation, the challenge of the hunt. I trust that the Lord will use all of this for His glory. Maybe this insight will help someone, somewhere, someday?